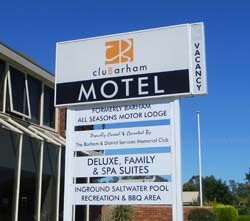 cluBarham Motel is conveniently located in the main street of Barham. Take a right turn after coming over the bridge into Barham (Murray St), continue down through roundabout, past cluBarham on your right and we are on the next corner on your right. Follow the Calder Hwy from the city towards Bendigo. Take the Marong of ramp. Continue through Marong to Bridgewater, Serpentine and Kerang following the signs. From Kerang head to Koondrook which is on the Victoria side of the Murray River and come over the bridge to Barham.